Back in 1999 or 2000 Jaime Headden sent me his skeletal reconstruction of what was then known as Titanosaurus colberti (Jain and Bandyopadhyay 1997), but which has recently been renamed Isisaurus colberti by Upchurch and Wilson (2004). Jaime’s skeletal reconstruction and life restoration are here. Somebody threw a skin over the recon to produce this life restoration. As you can see, the sauropod as reconstructed by Jaime is weird as heck. I tried my own, and it came out quite a bit differently, but also weird as heck. I have to give a lot of the credit to Jaime; my recon is basically his, traced, with some of the elements scaled differently. We’ve got two weird and conflicting reconstructions, based on two conflicting sets of measurements from the same paper! So what now? I’ve always intended to update this. I would make a start by scanning all of the elements from Jain and Bandyopadhyay (1997) and saving them as separate layers in Photoshop or GIMP. Then each element can be rescaled at will. And I’d build a background grid to hopefully help keep the scaling honest, like I did with my Brachiosaurus and Sauroposeidon skeletal recons. And I’d probably try plugging the Isisaurus elements into Mark Hallett’s Rapetosaurus skeletal reconstruction; back when Jaime and I were working on our drawings no one had ever found a reasonably complete titanosaur so we were both working a bit in the dark. All that would possibly make for better versions of these drawings, but the fundamental difference is in the measurements, and those aren’t going to change until someone measures the skeleton again to check whether the scale bars or the published measurements are accurate. My guess is that the published measurements are accurate, or at least a lot more accurate than the scale bars. Scale bars are notoriously difficult to get right, but it is hard to creatively misuse a tape measure. Still, for now, we just don’t know. We know that Isisaurus must have been pretty darn weird because its cervicals are so short. I tend to spend most of my time thinking about critters like Sauroposeidon and Erketu and Mamenchisaurus youngi, in which the cervical centra can be six times as long as tall or even longer. Isisaurus went the opposite direction–its cervical centra are only about twice as long as tall, right down the column. 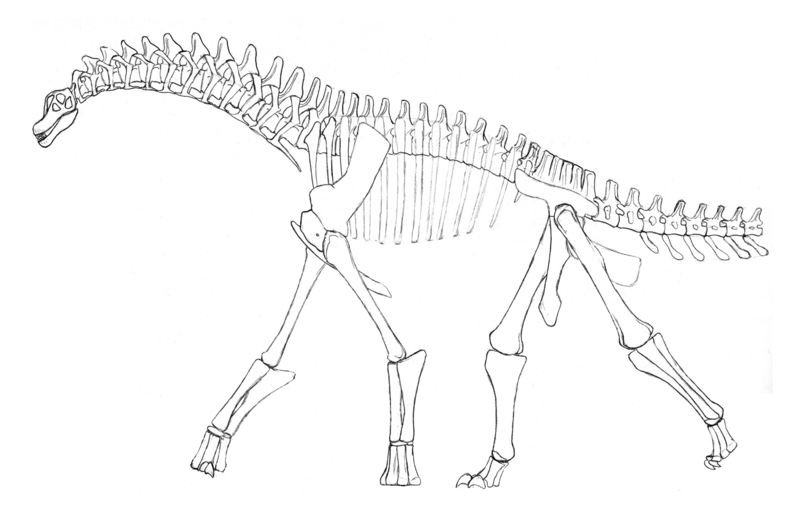 The only other sauropods with such short cervicals are dicraeosaurids such as Brachytrachelopan. Given the other examples of homoplasy between diplodocoids and titanosaurs, I wonder if Isisaurus and Brachytrachelopan were ecological analogues, and I wonder what they were up to. Jain, S.L., and Bandyopadhyay, S. 1997. New titanosaurid (Dinosauria: Sauropoda) from the Late Cretaceous of central India. Journal of Vertebrate Paleontology 17:114–136. Wilson, J.A., and Upchurch, P.2003. A revision of Titanosaurus Lydekker (Dinosauria– Sauropoda), the first dinosaur genus with a ‘Gondwanan’ distribution. Journal of Systematic Palaeontology 1: 125–160. I’ll be the first to admit that sauropods aren’t my thing, but did you scale the limbs to match with your source on the neck? It seems really bizarre. Could the neck have fed low with such long legs? That’s rad…I’d like to take a shot if I can ever get reliable measurements. Wikipedia (and I’d assume the paper it references) suggests that Brachytrachelopan (don’t know the command for italics!) may have evolved as an analog for the Iguanodon species that are missing in its area–utilizing the low browsing niche. Hmm. Horses are “bottom browsers” (actually “all over browsers”*) and they have long legs, but they’re obviously cursors. It’s not clear how much help longer legs would be to a dinky sauropod, but maybe every little bit helps. Also, we don’t actually know how long the legs of Brachytrachelopan were, because no forelimbs were recovered and we only have the parts of the hindlimb bones; crucially, the mid-shafts are missing. * Some of Bob Feranec’s isotope work has shown that horses and most other big “grazing” mammals never stopped being browsers, they just added grazing to their feeding repertoire. Nice trick. Also… it is just me, or is the right front leg of the sauropod in the life restoration more than just a bit hyperextended? Tibia/Fibula and below are at a near 90 degree angle facing forward–weird! Wait, nevermind. It’s been a long day… feel free to delete that comment! In fact, please do. Heh. Please excuse my ignorance, but what’s wrong with a cursorial sauropod? Is it too big? But can’t it have inherited long legs from its cursorial juvenile form, which must have had rather more need to escape predators than Mom had? Ah, Nathan, you ask an EXCELLENT question. I wonder, if we’d found only fragments of the giraffe (and had nothing similar alive now), would we be similarly perplexed by it? Are there compelling reasons why a large cursorial animal can’t evolve from a large non-cursor rather than from a small cursor? I am looking forward to the day when we have a nice representation of skeletal reconstructions from across Titanosauria so people can appreciate how freaking diverse/disperse that clade is! Right. We all talk airily about Titanosauria as though it is, diversity- or disparity-wise, more or less equivalent to something like Brachiosauridae. In fact, it’s more similar to Diplodocoidea. The frustrating thing is that there’s enough decent material known now to knock that idea on the head, but even though much of it has been described, is mostly been done in such a cursory way that it leaves us not much wiser. Understandable enough, of course — those big dudes are leaping out the ground at such a pace is some corners of the world that you can hardly blame the workers there for wanting to rush on the each new one before the last one’s been given proper treatment. But still frustrating. On the positive side, there is PLENTY of Descriptive Monograph work to go around. Now THAT is a wierd sauropod, assuming Jaime’s skeletal turns out (in the future, with more material) to be in any way accurate. Do we know that juveniles of stem sauropods weren’t cursorial? If I were a juvenile stem sauropod with an allosaur on my tail, I’d be about as cursorial as I could possibly manage, phylogenetic propriety be damned. If I were a juvenile stem sauropod with an allosaur on my tail, I’d be about as cursorial as I could possibly manage, phylogenetic propriety be damned. Dammit, Nathan, we don’t go to all this work just so you can swoop in and make all the good jokes. Or maybe we do. It’s been going on for almost two years now. Ah, heck, keep ’em coming. For the record, this is not my skeletal diagram. Mine is located here, where I actually scaled the measurments also from the measurments in the paper where given, over that of the figures. Figure-based calculations were only used in the absence of other measurements. Err, crud — my error, I was posting hastily and cannot amend my post! I really want to redo this skeltal, since I am almost certain the scaling is unique and not to be trusted. The vertebrae alone make me question it, and the limbs do not help. If I had to take a guess, I would increase the dorsals, reduce the pelvis, and increase the lower-limb segments relative to the upper limbs. I would alter the posture of the spine, as well, and elevate the column generally, with a U-shape swing of the cervical series. Jaime, I think your skeletal is already quite good but I can’t wait to see the revised version! I did notice it was a bit rough, but overall the wacky proportions seem believable for now. Matt’s version looks a bit mismatched though…. he’s certainly got a point about the legs being perhaps too long… and I don’t think the neck was so short even though the vertebrae are compressed lengthwise. I can’t imagine a long-legged sauropod like Isisaurus having a short neck… although Brachytrachelopan is missing the forelimbs, I’d guess they were short like with other dicraeosaurs. Of course the discrepancy in Isisaurus measurements is a good reminder of why the researchers should follow the code of M.Y.D.D. almost religiously. We need more consistent measurements. Matt and I discussed this skeletal concept way back when when I asked him for his advice on the topic. He noted the skewed measurements to figures issue, which Scott here has also noted elsewhere. At the time, both of us made our reconstructed based on a given paradigm: Mine was figure-driven, his was measurement-driven. Neither of us is saying our recons are accurate,. so they do not compete. I will eventually clean mine up, but it must derive from an accurate system of measurements, and I think Matt is in a better position to acquire those than I. Until then, this is just a piece of art, even if it seems elegant. There are several pieces of dissonace in the reconstruction that make it problematic when viewed along all of sauropod-dom, including the incredibly short ulna, and the proportions of the dorsal/cervical vertebrae, and of course, the sacrum. Solving these with new description is the best course. Speaking of Isisaurus, what exactly did old Jainosaurus septentrionalis and big old bruhathkayosaurus look like? Was the former just a…um…generalized-looking thing unlike Isisaurus? what exactly made Isisaurus evolve a neck like that, and what was it eating? Isisaurus is perhaps the craziest looking sauropod I’ve ever seen…………………. On the forelimb measurements, many authors seem to find is hard to accurately show scale against photos/illustrations, especially for larger bones, consistently. This might come down to variations in methods used to derive scale. Nothing beats a detailed table of measurements/reporting in text! I’m less inclined to trust scale bars in figures, especially for large bones (which may look like different lengths depending on view & orientation). The reported ulna measurement is a ratio: “the humerus/ulna length ratio is 25/14”. I interpret this to mean the ulna is 56% the length of the humerus (which is provided as “148” – no units, but I assume in cm! So the ulna could be ~83cm long, supporting Matt’s less-weird (IMO) skeletal over Jaime’s one. The moral: scale bars for individual bone figures (not for whole skeletals) can’t be trsuted. (B) shorter necks with shorter cervicals (relatively more flexible) = swifter darting arcs = feeding on specific elements more discontinuously distributed (fruits, or even fruits of a specific desired ripeness). Other things (such as feeding height) being equal, type B sauropods would need longer legs (especially forelegs) to get their heads up in food range, whereas type A’s could achieve that more by their longer necks. This suggests to me a possible project for someone: comparison of dentition and skull morphology, relative to cervical length and limb proportions, in sauropods. armadillozenith, I wouldn’t bet against some kind of partitioning along the lines that you propose. The problem is, how would you go about demonstrating (or falsifying) the idea? Hmm, I’ve gotten access to JStor, where you can get the paper, and I have a pdf of it. But one silly thing I noticed is that there is fig. 1a hand drawn showing the specimen in situ. Thus, it is fairly easy to get the proportions right simply by having them the same as on there. « How tallweird was Sauroposeidon?